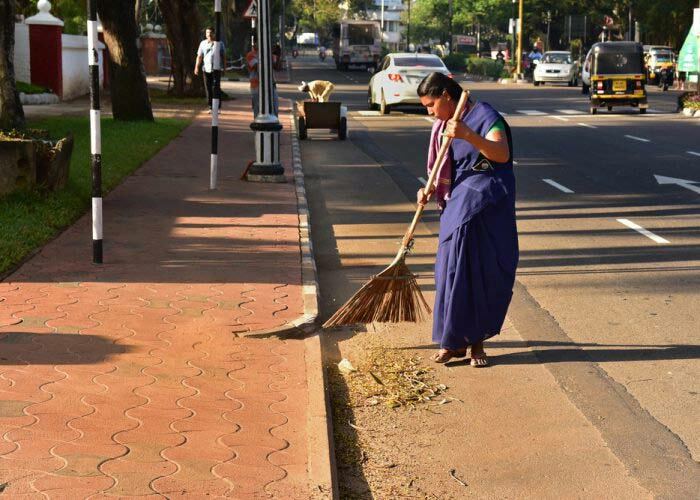 Swachh Bharat Abhiyan is a cleanliness drive aimed to cover 4,041 statutory cities and towns all over India in order to clean the streets, roads and other infrastructure. Swachh Bharat Abhiyan is a cleanliness campaign run by the government of India and initiated by the Honourable Prime Minister, Narendra Modi. It is a most important topic which our kids and students must know and be aware of this mission. ‘Swachh Bharat Abhiyan’ or ‘Clean India Mission’ is an initiative led by the Government of India to make India a clean India. This campaign was launched officially by the Government of India on 145th birth anniversary of the great person, Mahatma Gandhi on 2nd of October, 2014. It was launched at the Rajghat, New Delhi (the cremation ground of Mahatma Gandhi). The Government of India has aimed to make India a clean India by 2nd of October 2019 (means 150th birth anniversary of the Mahatma Gandhi) through this campaign. It is a politics free campaign inspired by patriotism. It is launched as a responsibility of each and every Indian citizen to make this country a Swachh country. This campaign has initiated people globally towards cleanliness. Teachers and students of schools are joining this ‘Clean India Campaign’ very actively with great fervour and joy. Under this campaign, another cleanliness initiative has been started by UP CM, Yogi Adityanath in March 2017. He has banned chewing paan, gutka and other tobacco products in the government offices all over UP. Swachh Bharat Abhiyan is a campaign launched by the Prime Minister, Narendra Modi as a nationwide cleanliness campaign. It is implemented to fulfill the vision and mission of clean India one day. It was launched especially on the birth anniversary of the Mahatma Gandhi as he always dreamed and was very keen to make this country a clean country. He had tried for clean India during his time by motivating people through his campaigns and slogans however it was only partially successful because of the limited involvement of the people of India. But after so many years, Swachh Bharat Mission was again started by the Government of India to make the dream of clean India come true till 150th birth anniversary of the Mahatma Gandhi. It was started in 2014 on 2nd of October on the 145th birth anniversary of Mahatma Gandhi. It is a big challenge for all the citizens of India. It is only possible if each and every person living in India would understand this campaign, their own responsibility and try to join hands together to make it a successful mission. The mission is promoted by the many famous Indian personalities to spread this mission as an awareness programme throughout the country. In order to ensure cleanliness, UP CM, Yogi Adityanath, has banned chewing of paan, gutka and other tobacco products in the government offices across the state, since March 2017. Swachh Bharat Mission or Swachh Bharat Abhiyan is a campaign run by the Government of India as a massive mass movement to initiate the theme of cleanliness all through the India. This campaign was launched in seeking the way to create a ‘Clean India’ target by 2019, 2nd of October, the 150th birth anniversary of the Mahatma Gandhi. The father of nation, Mahatma Gandhi had always dreamed to make India a clean India and always put his hard efforts towards cleanliness in India. This is the reason, why Swachh Bharat Abhiyan was launched on 2nd of October (the birthday of the Mahatma Gandhi). To complete the vision of the father of the nation, Indian government has decided to launch this campaign. In March 2017, UP CM Yogi Adityanath has also banned chewing of paan and gutka to ensure cleanliness in UP government offices. The aim of the mission is to cover all the rural and urban areas in order to present this country as an ideal country before the world. The mission has targeted aims like eliminating the open defecation, converting insanitary toilets into pour flush toilets, eradicating manual scavenging, complete disposal and reuse of solid and liquid wastes. The Swachh Bharat Abhiyan aims at bringing behavioral changes in people and to motivate health practices, spreading cleanliness awareness among people and strengthening the cleanliness systems in all areas. It helps in creating user friendly environment for all private sectors interested for investing in India for cleanliness maintenance. This mission has an interesting theme of inviting nine new people by each person involved in the campaign and continuing this chain until the each and every citizen of India gets involved in this campaign. Swachh Bharat Abhiyan is a nationwide cleanliness campaign run by the Government of India and initiated by the Prime Minister, Narendra Modi on 2nd of October in 2014 on the 145th birth anniversary of the Mahatma Gandhi. This campaign has been launched to fulfill the aim of cleanliness all over India. The Prime Minister has requested the people of India to involve in the Swachh Bharat Mission and promote others to do the same for leading our country as a best and clean country of the world. This campaign was initiated by the Narendra Modi himself by cleaning the road on the way going to launch the campaign. The campaign of Swachh Bharat is a biggest ever cleanliness drive of India during the launch of which around 3 million government employees and students from schools and colleges participated in the campaign. On the day of launch, Prime Minister has nominated the names of nine famous personalities of India to initiate the campaign in their own areas at their decided dates as well as to promote the campaign to common public. He also requested all nine personalities to invite other nine people from their end to individually participate in this event as well as to continue this chain of inviting nine people until the message reach to each and every Indian citizen. People across the nation clean their locality and pledge to keep their surroundings clean and green. Prime Minister requested that every Indian should take this campaign as a challenge and try his/her best to make it a successful campaign ever. The chain of nine people is like a branching of the tree. He requested common people to involve in this event and upload the videos or images of cleanliness over the internet via various social media websites like Facebook, Twitter etc so that others can also get motivated to do the same in their own area. In this way India can be a clean country. The Swachh Bharat Abhiyan is leaving no stones unturned in providing as well as improving cleanliness and sanitation facilities in the country. The effect of the mission has already started showing its result in almost all the parts with the active involvement of people from all walks of life. If the same pace continues in making the country clean and green then the dream of Mahatma Gandhi will definitely come true on his 150th birth anniversary in 2019. The father of the nation, Mahatma Gandhi had once said that, “Sanitation is more important than Independence” during his time before the independence of India. He was well aware of the bad and unclean situation of India. He had emphasized a lot to the people of India about cleanliness and sanitation as well as its implementation in the daily lives. However, it was not so effective and was unsuccessful because of the incomplete participation of people. After so many years of independence, a most effective campaign of cleanliness is launched to call people for their active participation and complete the mission of cleanliness. The Former President of India, Mr. Pranab Mukherjee has said in June 2014 while addressing the Parliament that, “For ensuring hygiene, waste management and sanitation across the nation a Swachh Bharat Mission will be launched. This will be our tribute to Mahatma Gandhi on his 150th birth anniversary to be celebrated in the year 2019”. In order to fulfill the vision of Mahatma Gandhi and make India an ideal country in the world, the Prime Minister of India initiated a campaign called Swachh Bharat Abhiyan on the birth anniversary of Mahatma Gandhi (2nd of October 2014). This campaign has the target of completion of mission till 2019 i.e. 150th birth anniversary of the Mahatma Gandhi. Through this campaign the Government of India solves the sanitation problems by enhancing the waste management techniques. Clean India movement is completely associated with the economic strength of the country. The birth date of the Mahatma Gandhi is targeted in both, the launch and the completion of the mission. The basic goals behind launching the Swachh Bharat Mission are to make the country full of sanitation facilities as well as eliminate all the unhealthy practices of people in daily routines. The first cleanliness drive in India was started on 25th of September in 2014 and was initiated by the Prime Minister, Narendra Modi by cleaning up the road. The completion of this mission would indirectly draw the attention of business investors in India, enhance the GDP growth, draw tourists attention from all over the world, bring variety of sources of employment, reduce health costs, reduce death rate, and reduce lethal disease rate and many more. Clean India would bring more tourists and enhance its economical condition. The Prime Minister of India has requested to every Indian to devote their 100 hours per year for the cleanliness in India which is very sufficient to make this country a clean country by 2019. Swachh Bharat cess is also started to get some fund for this campaign. Everyone has to pay extra 0.5% tax (50 paise per 100 rupee) on all the services in India. Swachh Bharat Abhiyan is one of the most important initiatives taken by the government to make India shine in the world. But what it requires the most is the active participation of each and every individual irrespective of its caste, creed or religion. If we want our country to be respected and revered in the world then we should devote ourselves in this campaign by contributing to the cause and spreading the awareness of Swachh Bharat Mission then only the dream of Mahatma Gandhi could be achieved in real sense. Swachh Bharat Abhiyan is a Clean India drive and Mission launched as a national campaign by the Indian Government in order to cover the 4041 statutory towns aiming to maintain cleanliness of streets, roads and infrastructure of the country. Indian Prime Minister, Narendra Modi has officially launched this mission on 2nd of October (the birth anniversary of the Mahatma Gandhi) in 2014 at the Rajghat, New Delhi (cremation ground of Bapu). While launching the event Prime Minister himself had cleaned the road. It is the biggest cleanliness drive ever in India where approximately 3 million government employees including students from schools and colleges took part in the cleanliness activities. On the day of launch of the event PM nominated nine people to participate in the cleanliness drive in their own areas. Schools and colleges participated in the event by organizing many cleanliness activities according to their own themes. Students of India participated in this event with full zeal and zest. PM also requested all those nine nominees to nominate another nine people separately to participate in this cleanliness drive. The aim is to continue the chain of nominating nine people by each and every participated candidate of the mission until the message reaches every Indian in every corner of the country to make it a national mission. The mission aims to connect each and every individual from all walks of life by making the structure of branching of a tree. Swachh Bharat mission aims to construct individual sanitary latrines for household purposes especially for the people living below poverty line, converting dry latrines into low-cost sanitary latrines, providing facility of hand pumps, safe and secure bathing facility, setting up sanitary marts, constructing drains, proper disposal of solid and liquid wastes, enhancing health and education awareness, providing household and environmental sanitation facilities and many more. Earlier many awareness programmes (such as Total Sanitation Campaign, Nirmal Bharat Abhiyan etc) about the environmental sanitation and personal cleanliness were launched by the Indian government however they were not very effective to make India a clean India. The major objectives of Swachh Bharat Abhiyan are removing the trend of open defecation, changing insanitary toilets into pour flush toilets, removal of manual scavenging, proper disposal of solid and liquid wastes, bring behavioral changes among people, enhance awareness about sanitation, facilitating the participation of private sectors towards cleanliness facilities. First nine nominated people by the Prime Minister for this campaign were Salman Khan, Anil Ambani, Kamal Hassan, Comedian Kapil Sharma, Priyanka Chopra, Baba Ramdev, Sachin Tendulkar, Shashi Tharoor and team of ‘Taarak Mehta Ka Ooltah Chashmah’ (a most famous TV series). Indian film actor Aamir Khan was invited on the launch of the mission. There were various brand ambassadors who were chosen by the PM to initiate and promote the campaign of Swachh Bharat in various fields. He also nominated some other dignitaries like Akhilesh Yadav, Swami Rambhadracharya, Mohammad Kaif, Manoj Tiwari, Deviprasad Dwivedi, Manu Sharma, Kailash Kher, Raju Srivastava, Suresh Raina etc on 8th of November in 2014 and Sourav Ganguly, Kiran Bedi, Padmanabha Acharya, Sonal Mansingh, Ramoji Rao etc on 25th of December in 2014. There were many positive results of the campaign. Many other programmes like Swachh Bharat Run, Swachh Bharat apps, Real-time monitoring system, Swachh Bharat short film, Swachh Bharat Nepal – Swasth Bharat Nepal Abhiyan were initiated and implemented to actively support the purpose of the mission. To ensure cleanliness in the official buildings of UP, chewing of paan, gutka and other tobacco products were completely banned by the Chief Minister of Uttar Pradesh. In order to continue and make this campaign successful, Finance Ministry of India has started a programme named Swachh Bharat cess, according to which, everyone has to pay 0.5% tax on all the services in India (i.e. 50 paise per 100 rupees) which will fund this cleanliness campaign. ‘Swachh Bharat Abhiyan’ or the ‘Clean India Mission’ should not only be the responsibility of the government or the ministries, it is the unison responsibility of every citizen residing in the country. Achieving the goal of clean India will never be possible until and unless we collaborate with each other and join hands to clean our surroundings and stop others from making it dirty. The participation and involvement of people in this campaign was definitely huge and also started showing positive results in recent times, but the most important thing is the continuation of this process. Let us pledge together that we will continue doing our bit in making our surroundings and environment clean and green and make our country respected in the world community. Swachh Bharat Abhiyan is started by the government to make India a completely clean India. Clean India was a dream seen by Mahatma Gandhi regarding which he once said that, “Sanitation is more important than Independence”. During his time he was well aware of the poor and dirty condition of the country that’s why he made various efforts to complete his dream however could not be successful. As he dreamt of clean India one day, he said that both cleanliness and sanitation are integral parts of healthy and peaceful living. Unfortunately, India is still lagging behind in cleanliness and sanitation even after 71 years of independence. According to the statistics, it has seen that very less percentage of total population has access to the toilets. It is a programme run by the government to seriously work to fulfill the vision of Father of Nation (Bapu) by calling people from all walks of life to make it a successful campaign globally. This mission has to be completed by 150th birth anniversary of Bapu (i.e. 2nd October of 2019) in next five years (from the launch date). It is urged by the government to the people to spend at least 100 hours in a year towards cleanliness in their surrounding areas or other places of India to make it a successful campaign. There are various implementation policies and mechanisms for the programme including three important phases such as planning phase, implementation phase and sustainability phase. Swachh Bharat Abhiyan is a national cleanliness campaign established by the Government of India. This campaign is covering 4041 statutory towns in order to clean roads, streets, and infrastructure of the India. It is a mass movement to create a Clean India by 2019. It is a step ahead to the Mahatma Gandhi’s dream of swachh Bharat for healthy and prosperous life. This mission was launched on 2nd of October 2014 (145th birth anniversary of Bapu) by targeting its completeness in 2019 on 150th birth anniversary of Bapu. The mission has been implemented to cover all the rural and urban areas of the India under the Ministry of Urban Development and the Ministry of Drinking Water and Sanitation accordingly. It is really very essential to eliminate the open defecation in India as well as making toilets facility available to everyone. It is to bring private-sector participation to develop sanitary facilities throughout India. The Swachh Bharat Mission of urban areas aims to cover almost 1.04 crore households in order to provide them 2.6 lakhs of public toilets, 2.5 lakhs of community toilets together with the solid wastes management in every town. Community toilets have been planned to be built in the residential areas where availability of individual household toilets is difficult and public toilets at designated locations including bus stations, tourist places, railway stations, markets, etc. Cleanliness programme in the urban areas (around 4,401 towns) have been planned to be completed over five years till 2019. The costs of programmes are set, like Rs. 7,366 crore on solid waste management, Rs. 1,828 crore on public awareness, Rs. 655 crore on community toilets, Rs. 4,165 crore on individual household toilets etc. Programmes which have been targeted to be completed are complete removal of open defecation, converting unsanitary toilets into flush toilets, eradicating manual scavenging, bring behavioral changes among public, and solid waste management. Gramin Swachh Bharat Mission is a mission implementing cleanliness programmes in the rural areas. Earlier the Nirmal Bharat Abhiyan (also called Total Sanitation campaign, TSC) was established by the Government of India in 1999 to make rural areas clean however now it has been restructured into the Swachh Bharat Mission (Gramin). The Swachh Bharat Swachh Vidyalaya campaign is run by the Union Ministry of Human Resource Development having the objectives of cleanliness in the schools. A major programme was organized under it from 25th of September 2014 to 31st of October 2014 in the Kendriya Vidyalayas and Navodaya Vidyalya Sangathans. Lots of cleanliness activities were held such as discussions over various cleanliness aspects in the school assembly by the students, teachings of Mahatma Gandhi related to cleanliness, cleanliness and hygiene topics, cleaning activities (in the class rooms, libraries, laboratories, kitchen sheds stores, playgrounds, gardens, toilets, pantry areas, etc). The cleaning of statue in the school area, speech over the contribution of great people, essay writing competitions, debates, art, painting, film, shows, role plays related to hygiene including other many activities on cleanliness and hygiene were also conducted. It was also planned to hold a half an hour cleaning campaign in the schools twice a week involving the cleanliness activities by the teachers, students, parents and community members. Swachh Bharat cess is an improvement in the service tax by 0.5% on all the services in India. It was started by the Finance Ministry to collect some fund from each and every Indian citizen for the Swachh Bharat Abhiyan in order to make it a huge success. Everyone has to pay extra 50 paise for each 100 rupees spent as service tax for this cleanliness campaign. Yogi Adityanath (Chief Minister of Uttar Pradesh), in March 2017, has banned chewing of paan, paan masala, gutka and other tobacco products (especially in the duty hours) in the government offices to ensure cleanliness. He started this initiative after his first visit to the secretariat annex building when he saw betel-juice stained walls and corners in that building. We can say Swachh Bharat Abhiyan, is a nice welcome step to make India clean and green till 2019. As we all heard about the most famous proverb that “Cleanliness is Next to Godliness”, we can surely say that Clean India Campaign (Swachh Bharat Abhiyan) will really bring godliness all over the country in few years if it is followed by the people of India in effective manner. So, the cleanliness activities to warm welcome the godliness have been started but it should not need to be ended if we really want godliness in our lives forever. A healthy country and a healthy society need its citizens to be healthy and clean in every walk of life.